A NEW and more effective means in preventing bank hold ups has recently been developed. On each side of the teller’s window are two automatic spraying devices, one with a strong odor of smoke stream and the other with a fine spray of a composition of formaldehyde. When both solutions meet they cause immediate blindness for at least 25 to 45 minutes, thus rendering the bandit helpless to operate any further. 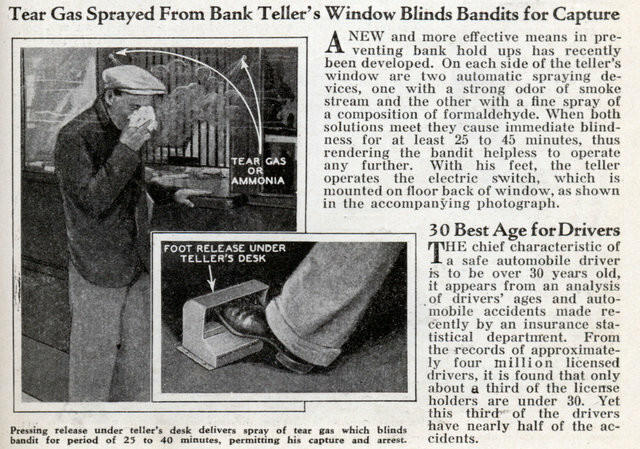 With his feet, the teller operates the electric switch, which is mounted on floor back of window, as shown in the accompanying photograph. Yeah but if the teller steps on that pedal accidentally, I think the customer might be peeved.